Looking for a vintage Tappan at a very good price? 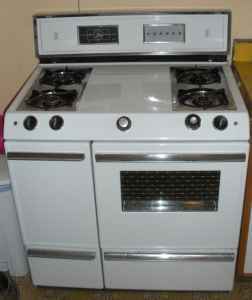 This stove is currently being offered for free on Craigslist. He says he even has the original manual. 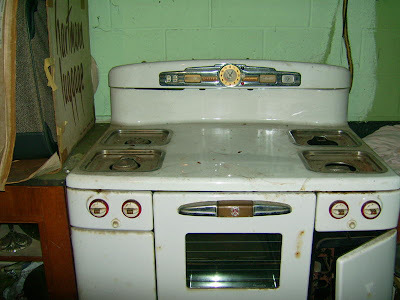 The owner says if he doesn't find a taker soon, the stove is going to the dump. You know you want it. Give him a call. 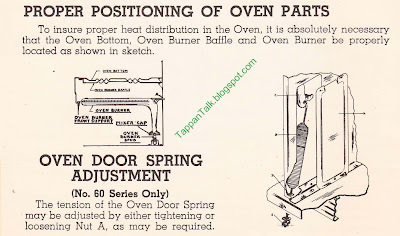 I've found three versions of instructions for adjusting the oven door spring. The first instructions below are from a 1949 Owner's Manual. The second set of instructions are from a 1950 Owner's Manual. The final set of instructions is from an early 1948 Owners Manual. 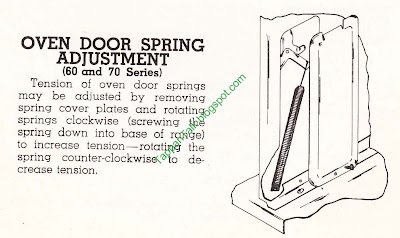 I'm posting all of them because they each give a little different information...and starting in 1950, it looks like the spring mechanism changed. The photos are from my stove. 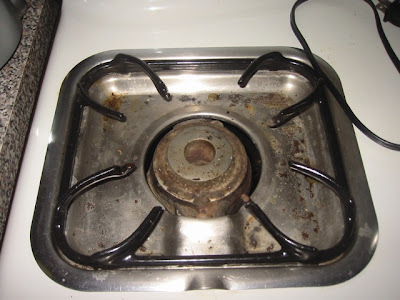 My stove does not have a wing nut to adjust on the bottom edge of the broiler, but it's an earlier stove...so I'm not sure what to make of that. I've also noted that none of the manuals show the insulation that is stuffed into my spring compartment. I guess that's the ideal vs the reality. 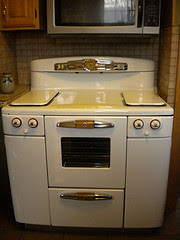 Chaz's stove looks a lot like Model 640 from my 1940's Philgas Sales Manual (could it be a model 634?). 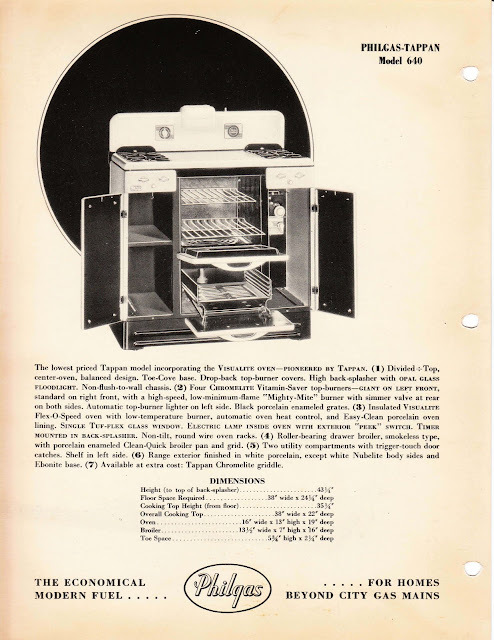 The turn handles on the side compartments must have been changed to "trigger touch" lift release knobs about 1940...because there are also photos in the same Sales Manual that show the turn handles. Chaz - thanks for the photo. 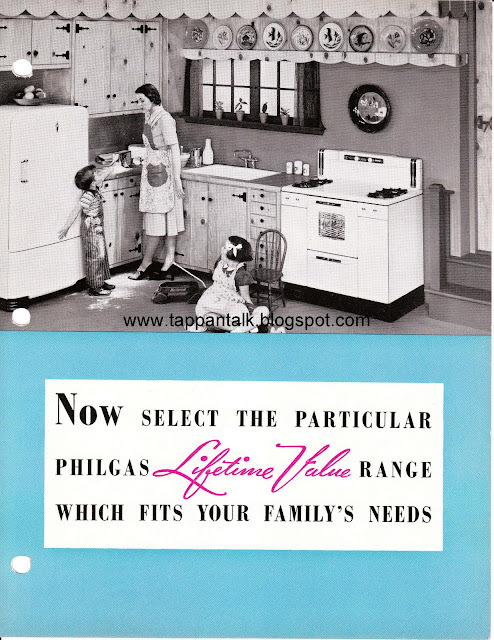 Here is a page out of a 1941 Sales Manual for Philgas-Tappan stoves. Photos of another reader's Tappan Deluxe AV-669 model for you. "Max" was discovered in blog reader Charles' grandmother's basement. It had been untouched for many years since his grandfather passed away. His grandfather had taken apart the thermostat and parts but never got around to replacing them. 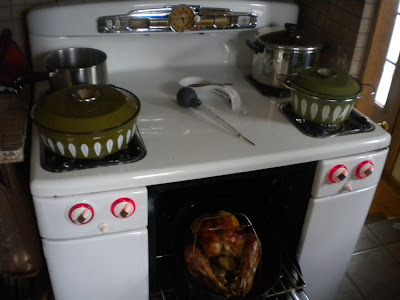 Charles was able to replace the thermostat with a Robertshaw 2200 and get the stove hooked up in order to use it for Thanksgiving. The Robertshaw 2200 is a non-CP thermostat, so Charles is now on the hunt for a Robershaw 2200-s that has both manual and automatic operation. 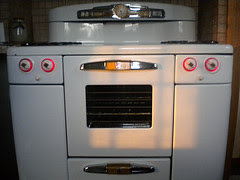 Max also has a replaced light fixture inside the oven, reconnected wiring to make the light on the top operable, and has newly functioning illuminated burner knobs (thanks to some creative soldering). On the "to do" list is rewiring the clock. If anyone has tips on rewiring the clock, please comment. 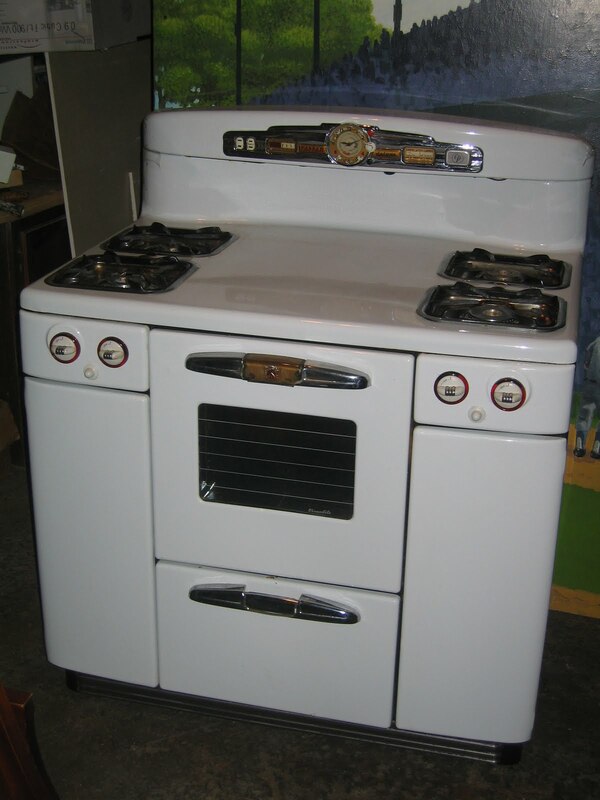 This Tappan Deluxe will eventually be the focal point in a retro/modern kitchen in an renovated apartment in an old sweater factory that was a speakeasy during prohibition (1931-33). Charles - thanks for sharing your photos! 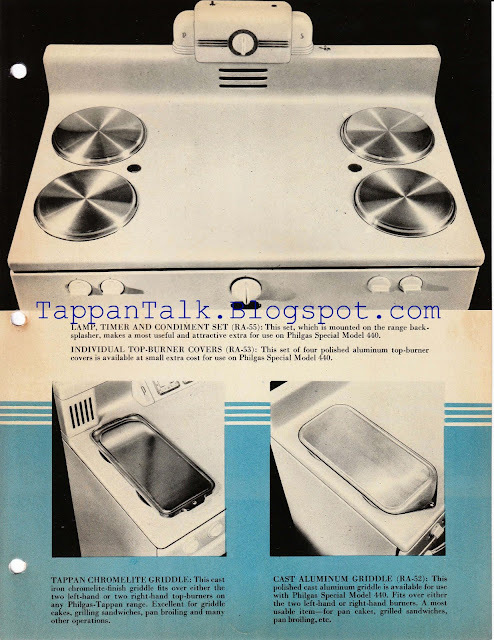 This set of salt and pepper shakers came with a Tappan Deluxe stove purchased by one of Tappan Talk's readers. She was told that they originally came with the stove. 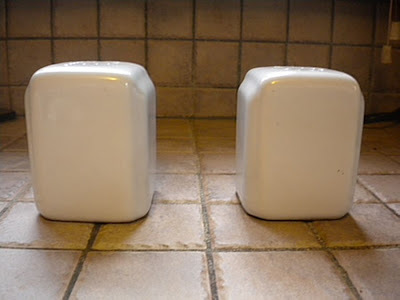 Has anyone else seen this white version of Tappan salt and pepper shakers? Notice that they have little "roman arches" similar to the blue and yellow McKee salt & pepper shakers. Thanks Katy for the photos! 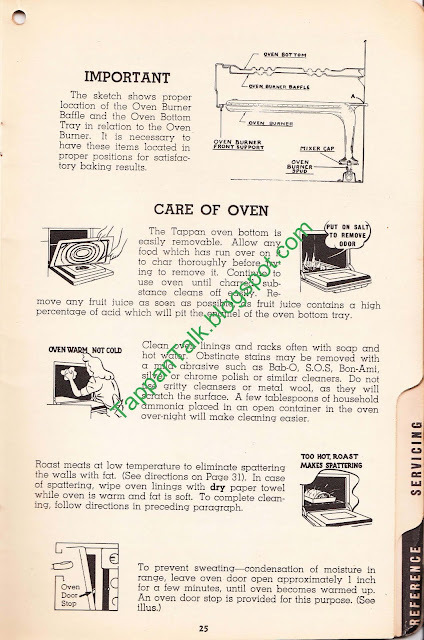 These pictures were taken out of the 1940's Sales Manual for Tappan Philco stoves. 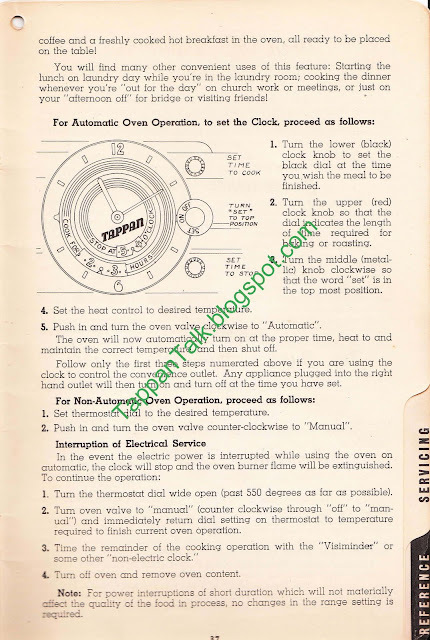 The manual also includes a number of non-Tappan Philco stoves (the mentioned Model 440 isn't a Tappan). 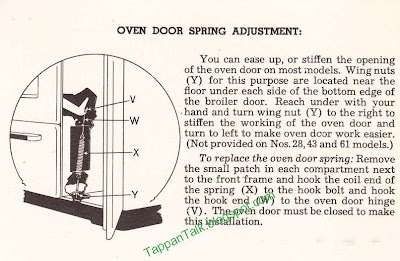 I thought it was fun because it shows the Tappan Chromelite cast iron griddle sold as an extra for the early Tappan stoves. It also shows a similar non-Tappan cast aluminum griddle. In 1940, the list price for both of these griddles was $4.50. 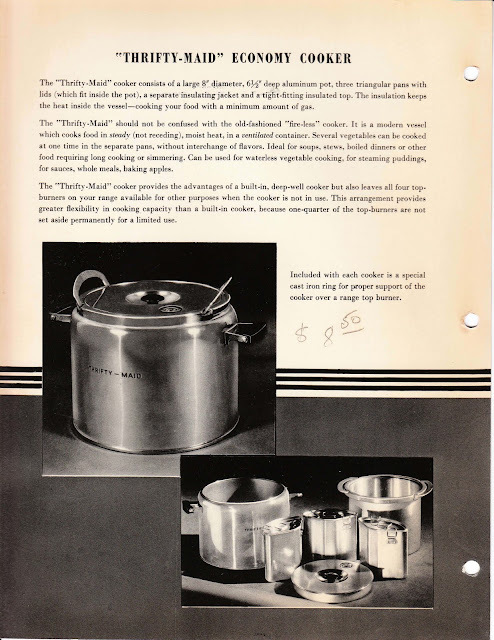 The "Thrifty-Maid" Economy Cooker was sold as an accessory to all of the Philco stoves (Tappan or not). List price for the Thrifty-Maid was $8.50. 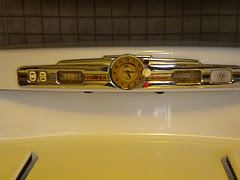 The Tappan Deluxe has two different versions of clocks. 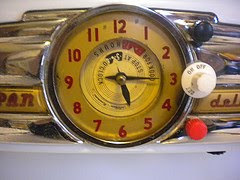 The first is the Telechron Clock, generally found on non-CP stoves. It functions as a clock and has a timer that buzzes. Pretty simple. There appears to be a few different versions of this clock. 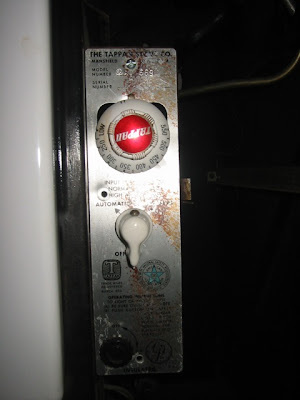 Mine has large red numbers on a face plate (and does not say "telechron" on it), but I have seen older stoves with smaller numbers with intervals for timing. If anyone has more info. on this, I'd be interested in hearing it. 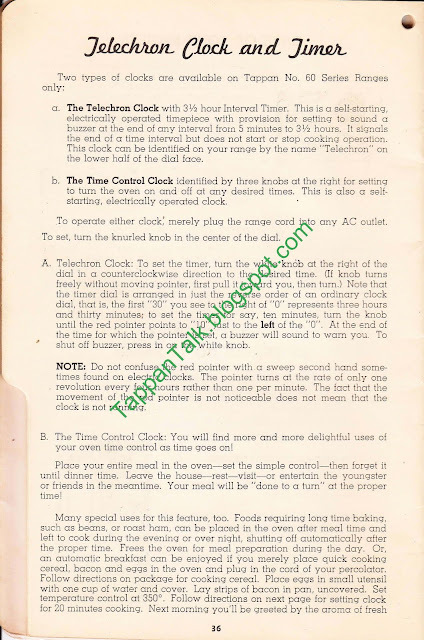 The second style is the Time Control Clock. This is the clock style found on CP stoves. 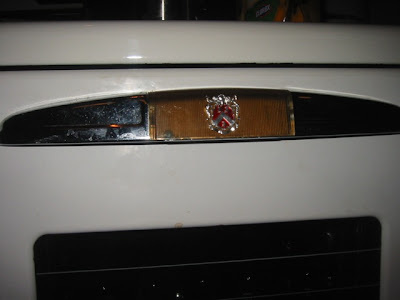 It has three knobs on the right side (black, red and metallic or white). It functions as a clock, but it also works as a timer to turn the oven on and off. 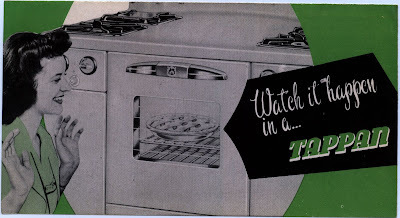 Tappan advertised that you could set this clock with your full meal int he oven and then leave the house. I don't think I'd be brave enough to try that, but a handy feature nonetheless. P.S. I realized that I had the blog comments accidentally set so you had to register in order to comment. Oops. That has been fixed. If you tried to comment before and it was a huge hassle, I apologize. As I've been working on restoring my stove, I've amassed quite a collection of paints and sprays. 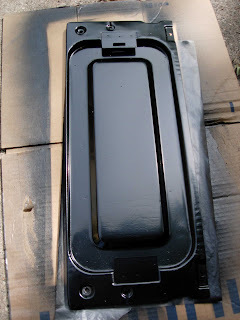 I've used Rustoleum High Heat paints in black to repaint parts that were originally painted (not porcelained) and are exposed to heat, but not direct flame (e.g. brackets, screws). I've been removing the light rust with steel wool & painting. I'm hoping to prevent further rust, as well as, and make them look good. I've found Liquid Wrench to be the solution to locked bolts and screws. I was also able to get the little wheels on my new pull out cutlery drawer to roll freely again using Liquid Wrench. Finally, I've used Rustoleum Appliance Paint in the inside panel of the side storage doors. 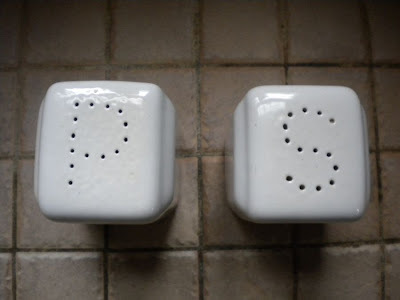 Mine were in quite bad condition, so I removed the chipped porcelain and rust and then painted them. I was very worried about doing this, but they turned out well. I was surprised at how easy it was to clean the oven. 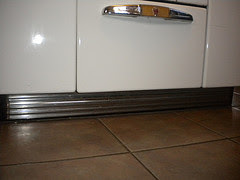 Following the diagram, you can lift out the oven bottom and oven baffle for cleaning. This also makes it pretty easy to clean both the oven and broiler interiors. Watch it Happen in a ...Tappan. 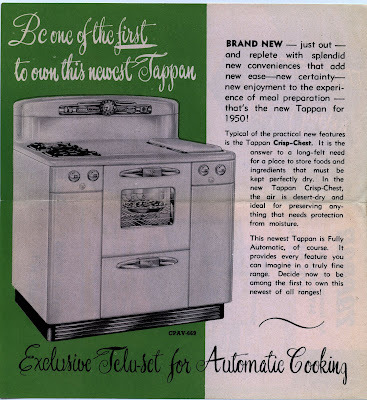 In 1950, Tappan introduced the Deluxe Model AV 669. This model was "CP", so it had a standing pilot light in the oven. 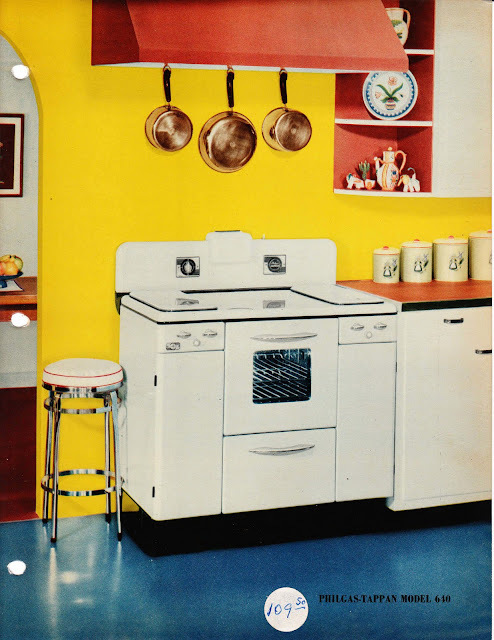 In reading the ad, we learn that this was the first model that contained the Crisp-Chest in the left hand storage area.....a nice clue when trying to figure out the date of your stove. This model also has the medallion insert on a chrome oven/broiler handle. 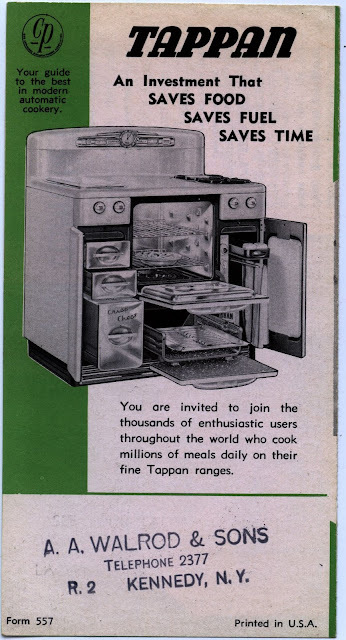 It also appears to have a chrome interior oven. Thanks to blog reader Joe M for providing the ad....and tips on model year. I have another set of blog reader's photos to share today. 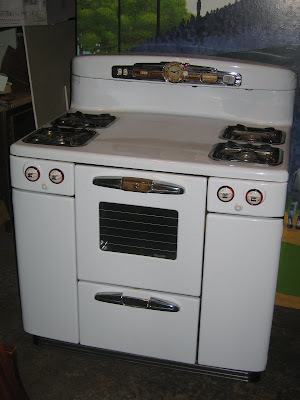 This time photos are of Katy's Tappan Deluxe stove. 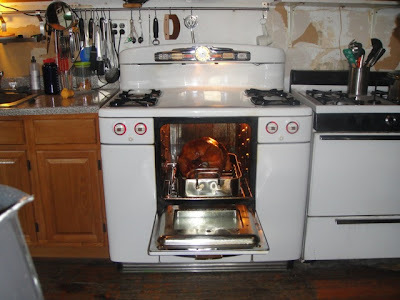 She currently has it installed and in use in her kitchen - check out Thanksgiving dinner. 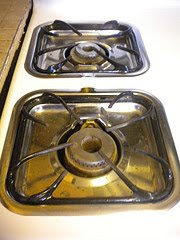 We "met" when she emailed me about her stove's oven pilot light (she's also the one who supplied me with the parts I was missing for my stove). 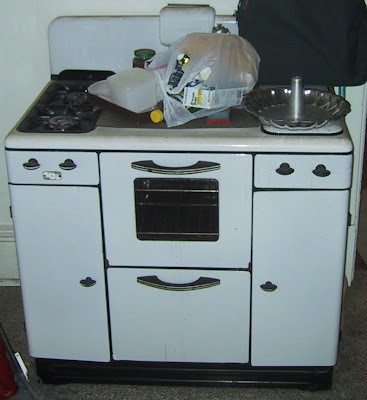 The stove is an AV 669-16 model, similar to Joe's stove in yesterdays post. After a long search, Katy managed to track down vintage red glass burner knob backs to replace those missing on her stove. A few of the pictures below show the burner lights on...with the red glass glowing. There is a very nice close-up of her Time Control Clock. 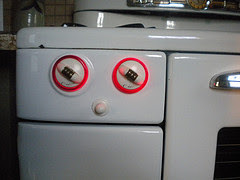 You can see the three knobs - one of which controls the timer that can be set to turn the oven on and off automatically. Her stove is also a CP model. 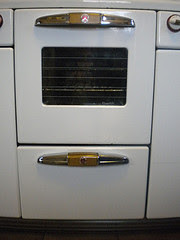 It has the gold package medallion on chrome oven and broiler handles....and the chrome base. Her back splash light turns on with a switch. She also has the chrome crisper drawers on the left side storage and the pull out drawer/towel rack on the right side storage. Again, thanks for share your photos! 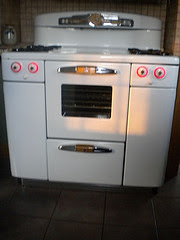 One of Tappan Talk's readers emailed photos of his stove to share. Joe's stove is a model AV-669-16 named "Precious" :) His stove has all of the bells and whistles - red glass back plates on the burner knobs, three chrome crisper drawers, and the "gold package" on the clock and handles. 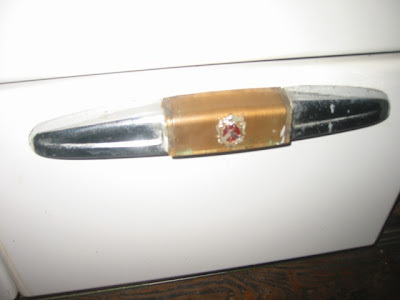 He recently hunted down a replacement for the missing broiler handle trim piece in the photo. You can see the sign on the far right side of the back splash indicating the stove is a CP stove. The clock has three knobs. The stove has a chrome base. 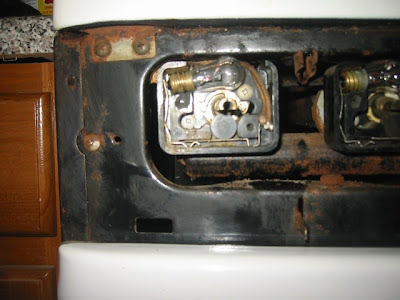 Note the burner cover trays stored in the side compartment doors. Over this past long weekend, one on my blog readers dropped off some parts I had been missing for my Tappan Deluxe :) And one I wasn't missing, but really wanted. The first photo is a shot of the orignal bracket that sat on the front corners of the top of the stove & held the top in place from underneath. Part of mine had rusted away. 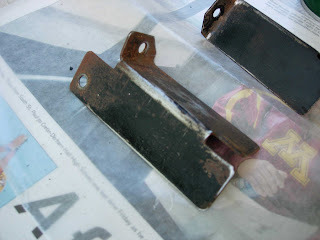 This next photo is of the freshly painted replacement bracket. Looks much better. One of my stove burner knobs was cracked in back and I kept meaning to order a new one. I now have a replacement. And finally, I always thought it would be fun to have one of the pull out drawers with towel holders for the right side storage compartment. I spent the weekend cleaning up this vintage drawer...took the wheels off to clean them...and used Liquid Wrench to get them rolling again. Because all of the bodies of the Deluxe are the same, it's a pretty easy matter to install this on my stove, even though my stove did not have this part originally. If you are looking for a vintage Tappan Deluxe parts, I have added Katy's contact information to the left sidebar (yellow shaded box). Shoot her an email and ask her is she has the part you need for sale/exchange.